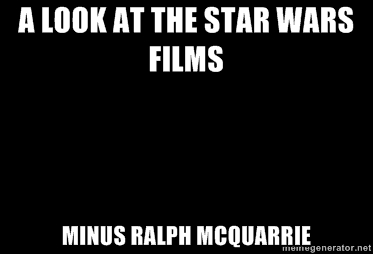 A few years ago there was a meme going around on Facebook which showed a completely black image with a tag-line which joked that it represented what the Star Wars universe would look like without artist Ralph McQuarrie. I imagine that the picture confused many people who were unfamiliar with his work. To the countless fans who recognized his name however, the meme represented a fairly accurate appraisal of his endless contributions to the visual aesthetic, character design, and general feel of that galaxy far, far away. 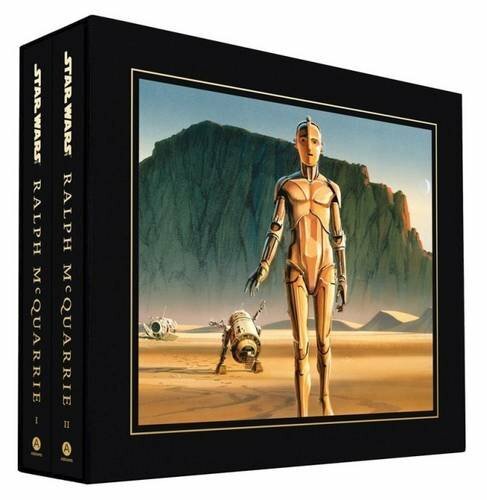 Star Wars Art: Ralph McQuarrie by Brandon Alinger, Wade Lageose, and David Mandel is a book which seeks to catalog that tremendous amount of material and honor the legacy it left. 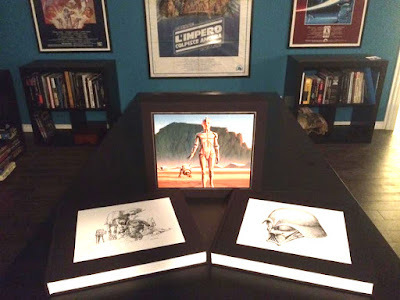 From the earliest pencil sketches Ralph McQuarrie jotted down upon first being hired to work on the Star Wars films, to the last painting he completed before his passing (the box art for what would have been an Action Fleet Jabba's Palace playset by Galoob), it's all presented in a professional and attractive way. His entire career working on the franchise, in chronological order, is offered to the reader to admire and appreciate. From designs for cast and crew patches meant to be used while filming the The Empire Strikes Back, to paintings of environmental settings later used after his death on the Clone Wars cartoon, and architectural designs which are still inspiring The Force Awakens and the movies beyond it. It's an amazing book to flip through and one is left with an even greater appreciation for a man who created the look of things fans know so well. The completeness of the book is due entirely to the tireless efforts of its authors to track down McQuarrie's work. They searched LFL's archives, museums, and private collections around the world, gathering up images of everything they could and sharing it in the book. Some of it has never been seen publicly before, which makes it even more exciting. The book reads like a mixture of the best art gallery any Star Wars fan could ever dream of strolling through, and a visit directly to the Star Wars galaxy itself, its buildings, planets and denizens laid out before you in meticulous detail and displaying the inspired imagination of the artist behind them. To put it simply: if you are at all interested in the Star Wars films, you need to buy this book. You really do. And I have no stake in sales of the book and have not been compensated for this review in any way. It's simply *that* good a book. No fan's library should be considered complete without it. It's also a LOT of art for the money. Spread out over two separately bound volumes, the book is a mind-blowing 800 pages! It weighs in at a staggering twenty pounds! If you're looking for a gift this holiday season for the Star Wars collector on your list, I can pretty much guarantee that they'll want this book. And just watching them try to lift it would be worth the price, even without the incredible art inside. Be sure to stay tuned to the SWCA Blog for an upcoming interview with one of the book's co-authors.